We envite you to enjoy your own private oasis by the beach. Cozy Studio with ideal location, quiet residential neighborhood. Beach and surfing just 2 1/2 blocks away. Restaurants, Bars, Coffee Shops, within walking distance. Full kitchen. Private entrance and lovely fenced patio area in back, surrounded by bamboo and honeysuckle. Biking distance to downtown LaJolla and Mission Bay. Pet friendly. Parking for 2 cars in driveway under canopy. Everything you need to enjoy the beach life provided; two bikes, beach chairs, towels, and boogie boards. Chips, Salsa and ingredients for 2 welcome margaritas in your room on arrival. Hi there! This is ourselves: Darren & Alisa Pedersen and our dog Buster. We are the owners and operators of the Tourmaline Beach Studio. There is nothing like living near the beach. Sunset walks, surfing, the fresh ocean air. Having a vacation rental on our property gives us the opportunity to share that ideal life with our guests. Everything you need is within walking or biking distance. And being the owners, we are here to provide anything extra you might need to make your stay complete. Our family of four enjoyed our stay. Wish I was able to have stayed longer. Was a very sweet place to stay. The owners were great and left us a nice surprise when we got there. Would definitely stay there again. Off street parking was great. the photos don't do it justice. the studio was super cute and roomy. perfect for my boyfriend and i to stay for the weekend. it was also close to everything. the host were very friendly and kept everything clean when we arrived. will definitely be coming back! We enjoyed staying at the Tourmaline Beach Studio so much that we are already planning our next visit! The owners are generous and hospitable, and made us feel very welcome and supported. 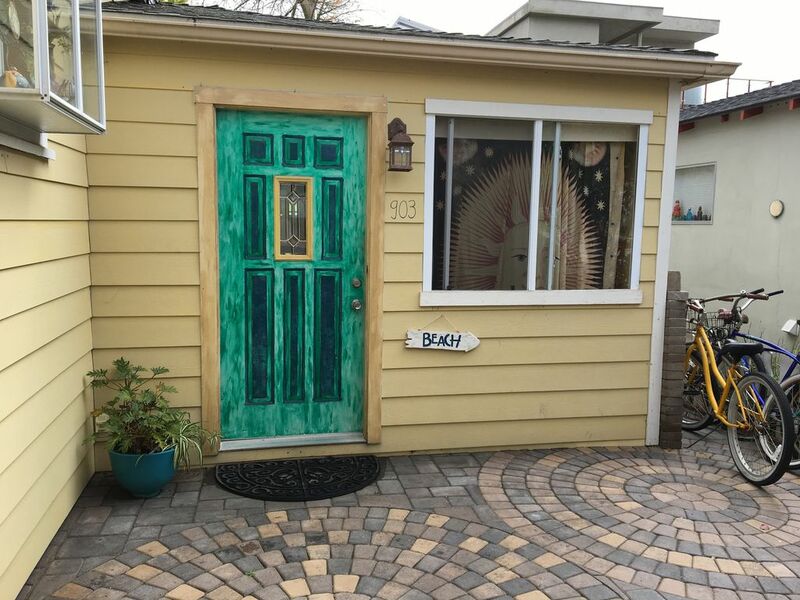 The paintings hanging on the walls are beautiful, the back yard patio a sweet place to enjoy a sunny morning or grilling in the afternoon, and the studio provided boogie boards and bikes for endless beach fun! The location is in a quiet neighborhood only a few blocks from the beach. This place is a little gem!! Great place, loved bike access and well stocked. The shower was cool & I loved the patio!